Joy De Vivre Design: Darn you groundhog! You look so innocent sitting there, not threatening by any means. 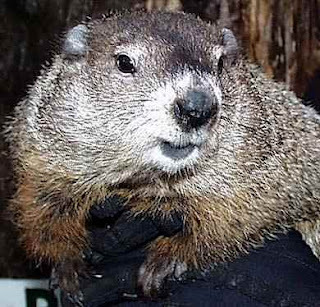 Why then Mr. Groundhog did you betray us on groundhog day? You could have just came out for your little morning walk and NOT have seen your shadow. Is that too much to ask from a society that gives a rodent its own day? Did you think that I wanted to wait until June to plant my spring flowers? Did you think that it was acceptable that my whole spring wardrobe has been ignored for sweaters that I have already been wearing for months and am frankly sick of? It is March in Texas and I have my heater on. There is something wrong with this picture.